The Consumer Futures Unit (CFU)'s report Leading By Example sets out the mechanisms that are used by 40 regulators and service providers within the regulated industries of energy, water and post to develop consumer-focused policy and practice. 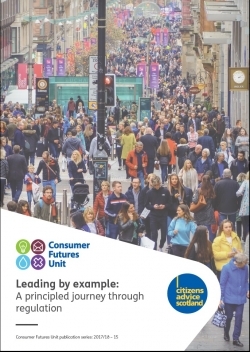 The CFU uses seven consumer principles to evaluate policy and practice from a consumer perspective, and encourages other organisations to use them as a tool to support the design of regulation, policy and practice. The principles seek to move organisations from thinking about consumers, to thinking like consumers.